Whilst on my travels in 2002/03 I noticed a number of warning signs which, doubtless necessary to remind the public at large of their mortality, seemed quite extreme. 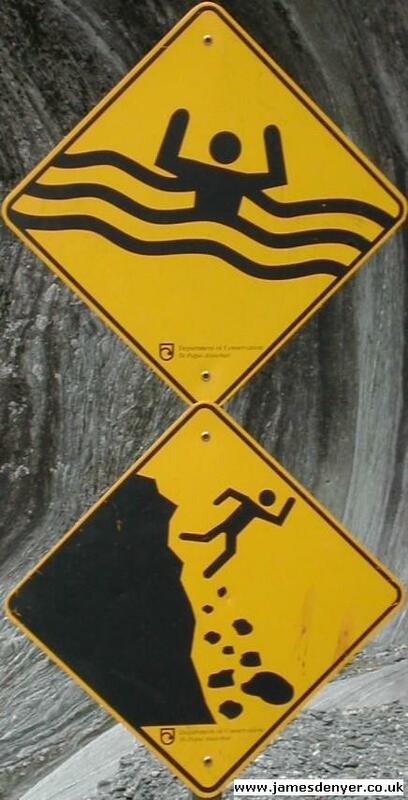 Often such warning signs are only placed because of some hapless fool who was not aware of their impending doom and met a sticky end at the bottom of a gorge or under a train or anything else that might happen in an episode of Road Runner. I should note that I’m not an authority on this, but it’s an educated guess. I would also like to thank the various authorities who put these signs up for the somewhat nerdy pleasure that I have taken from them. All images taken with a Nikon Coolpix 775. This was taken just outside the entrance of Castell Coch in South Wales. The danger here was a steep grassy slope down to the dry ‘moat’ (this was never a real castle, but more of a fairy castle built in the 1800s). I guess the warning sign shop was out of ‘stick man falling backwards down steep slope’ signs, and so they had to make do with the ‘stick man falling backwards off block of flats’ sign instead. 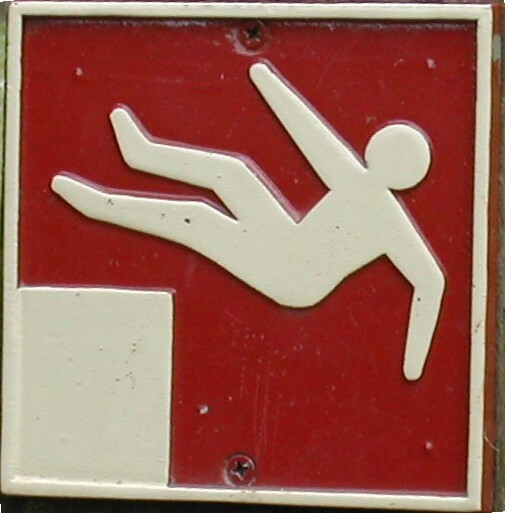 And hope that nobody noticed…This sign can also be turned 90 degrees anti-clockwise and used as a ‘people intentionally jumping off block of flats’ warning sign. 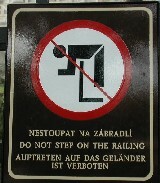 I found this sign in Cesky Krumlov, Czech Republic. Whilst it is instructing people not to ‘step on the railing’ the image suggests that we shouldn’t lean over the railing either. This would be equally dangerous as it would likely also involve impaling yourself on the spikes that top the railing. Why would anyone want to attempt either of these feats? To fall 30 feet into the bear pit of course! Also note that the graphic part of this sign can be turned 90 degrees clockwise to prevent people from the pleasures of sitting on the floor and eating Japanese style. A double whammy! Franz Josef Glacier, New Zealand. Not only did we run the risk of having our lower half turned into a huge rasher of bacon…hmmm, bacon…but also ran the risk of falling down steep slopes with some rocks thrown in for good measure or being on the receiving end of other people falling down steep slopes with rocks thrown in for good measure. Probably the latter, seeing as we were still at ground level and couldn’t fall off anything. Actually, this was a pretty dangerous place and a particularly dangerous day for us as there was a mild rain making the ice a lot smoother. We weren’t encouraged by our guide who said it was the slipperiest he had ever seen it and that he had had a heavy night before due to another guide’s birthday celebrations! Part 1 of an antipodean risk-fest. The Karijini National Park in Western Australia, whilst beautifully green and red after the end of the wet season, is an incredibly dangerous place. 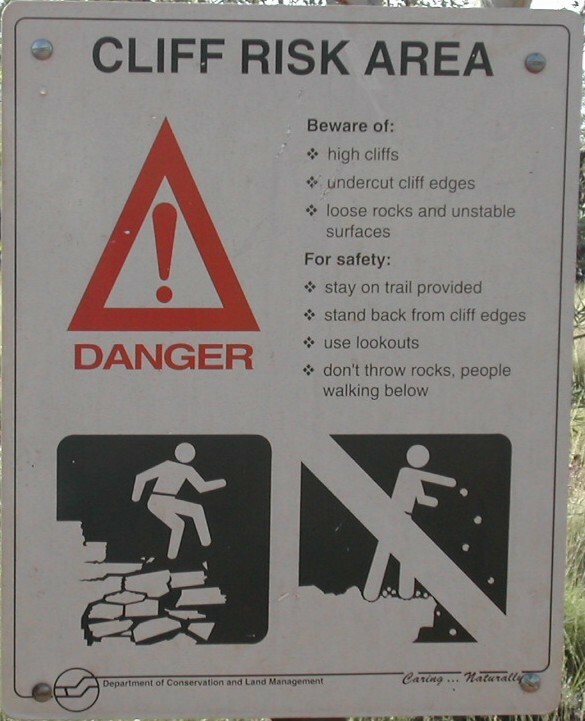 Not safe enough for Joe Tourist (typically lacking in common sense) if these signs are to be taken seriously. 1) The first graphic deals with the new Australian Department of Conservation and Land Management state of the art satellite system, now armed with flesh cutting laser beams that cast their judgement on any who dare dive on their submerged rocks. Was this poor soul going to get away with a broken jaw and some missing teeth? Who knows? The DCLM satellite judged that the hapless diver would have suffered a rather more uncomfortable demise and so dealt a swift, painless end by chopping him in half with it’s celestial laser. 2) I believe the second graphic to be a warning to all Karate Kid fans. This sign could simply be shortened to read the beginning of the second list – “For your safety: Leave gorge quickly”. Part 2 of the antipodean risk-fest continuing in Karijini National Park in Western Australia. 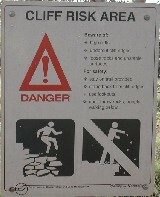 2) The second graphic demonstrates once again how the Australian Department of Conservation and Land Management cares for tourists by warning them not to throw bread crumbs into the velociraptor pit. The wording suggests otherwise, but we know better. 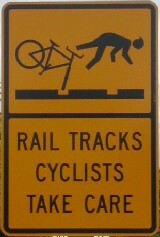 1) A statement telling motorists that pedestrians will give way to motorists. 2) A warning telling pedestrians to give way to motorists. 3) A warning to motorists that a bloody great exclamation mark is plummeting towards them and that pedestrians also witnessing this will stand still in the middle of the road. Like frightened rabbits. 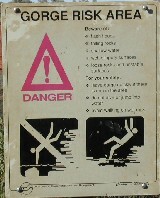 4) A warning to illiterate bikini clad models not to sit on highly waxed car bonnets. 5) The Dukes Of Hazzard. This is my favourite. It was taken somewhere near Greymouth, New Zealand. 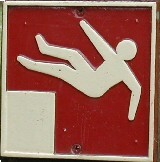 I’ve noticed that this sign has been adopted as the logo of http://failblog.org/.